I mentioned in my last post that Dr. Coe's assertion concerning the biology of iron was worth looking at a little more closely. Iron is a nutritional requirement for a number of species, perhaps even most, if not all. This isn't surprising given the fact that iron is a commonly occurring element and that life on earth has been exposed to iron throughout evolutionary time. But needing and using iron has not led to a common fixed biology of iron, despite Coe's assertion. Consider first the biology of iron in rats of the same species but from different strains. 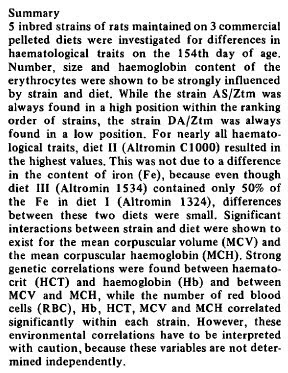 The following passage is from Strain differences in inbred rats: influence of strain and diet on haematological traits. Hackbarth H, Burow K, Schimansky G. Lab Anim. 1983 Jan. The results indicated that squirrel, rhesus and cynomolgus monkeys have essentially biologically similar values for all of the parameters examined. However, haemoglobin level, ... in cynomolgus monkeys [was] statistically lower than those of rhesus monkeys. ... [H]aemoglobin level, haematocrit, ... in cynomolgus monkeys were statistically lower than those of squirrel monkeys. In fact, iron biology even varies between human populations. For unclear reasons, anemia is more common in American blacks than whites. The authors evaluated anemia prevalence (using World Health Organization criteria) among 19,836 blacks and whites recruited in 2003–2007 for the REasons for Geographic And Racial Differences in Stroke Renal Ancillary study and characterized anemia by 3 anemia-associated conditions (chronic kidney disease, inflammation, and microcytosis). They used multivariable models to assess potential causes of race differences in anemia. Anemia was 3.3-fold more common in blacks than whites, with little attenuation after adjusting for demographic variables, socioeconomic factors, and comorbid conditions. Increasing age, residence in the US southeast, lower income, vascular disease, diabetes, hypertension, and never smoking were associated with anemia. Age, diabetes, and vascular disease were stronger correlates of anemia among whites than blacks (P < 0.05). Among those with anemia, chronic kidney disease was less common among blacks than whites (22% vs. 34%), whereas inflammation (18% vs. 14%) and microcytosis (22% vs. 11%) were more common. In this large, geographically diverse cohort, anemia was 3-fold more common in blacks than whites with different characteristics and correlates. Race differences in anemia prevalence were not explained by the factors studied. Future research into the causes and consequences of anemia in different racial groups is needed. Apparently, Coe's claim that the biology of iron is the same in monkeys, rats, and humans is not accurate or at least requires much qualification. Stating simply that the biology of iron is the same was misleading and apparently something other than a science-based claim.